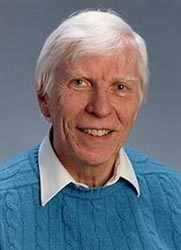 Alvin Tollestrup is Physicist at Fermi National Accelerator Laboratory (1977-present). Other institutional affiliations include California Institute of Technology. His research interests include the design and operation of colliding beam detectors and the design and construction of superconducting magnets. March 22, 1924Birth, Los Angeles (Calif.). 1944Obtained BS, University of Utah, Salt Lake City (Utah). 1950Obtained PhD in Physics, California Institute of Technology, Pasadena (Calif.). 1950 – 1977Research Fellow in Physics (1950-1953) and Assistant Professor to Professor of Physics (1953-1977), California Institute of Technology, Pasadena (Calif.). 1957 – 1958National Science Foundation (NSF) Fellow, European Organization for Nuclear Research (CERN). 1977 – presentPhysicist, Fermi National Accelerator Laboratory, Batavia (Ill.). 1989Awarded Robert R. Wilson Prize for Achievement in the Physics of Particle Accelerators, American Physical Society. 1996Member, National Academy of Sciences. Advisor at California Institute of Technology and both employed at California Institute of Technology. PhD advisor at California Institute of Technology, "Precision determination of the energy released in nuclear reactions in the light elements," and both employed at California Institute of Technology. Both employed at Fermi National Accelerator Laboratory. Both employed at California Institute of Technology and Fermi National Accelerator Laboratory. Obtained PhD in Physics (1950). Research Fellow in Physics and Assistant Professor to Professor of Physics. Received 1989 Robert R. Wilson Prize for Achievement in the Physics of Particle Accelerators. National Science Foundation (NSF) Fellow. Oral history interview with Alvin Virgil Tollestrup, 1994. Oral history interviews with members of Collider Detector at Fermilab (CDF), 1995. Selected talks from the International Conference on the History of Original Ideas and Basic Discoveries in Particle Physics [sound recording] / 1994. Leon Lederman retirement symposium [videorecording]. Oral history interview with Barry C. Barish, 1998 May-June.